You’ve asked and we’ve listened. Open road tolling has arrived at Eastern Terminal (MM 217) with more locations coming. Open road tolling allows highway-speed travel in electronic lanes but still provides a cash option that many Kansans want. It improves safety by moving slower traffic toward the right, like a traditional exit, and makes room for more electronic customers due to compatibility with other states’ tolling systems. Toll plazas changing to Open Road Tolling include Eastern Terminal near Kansas City, East Topeka, and Southern Terminal near the Oklahoma border. Electronic users continue traveling at highway speeds through the toll area. Cash travelers exit right to toll plaza for entry ticket or toll payment. 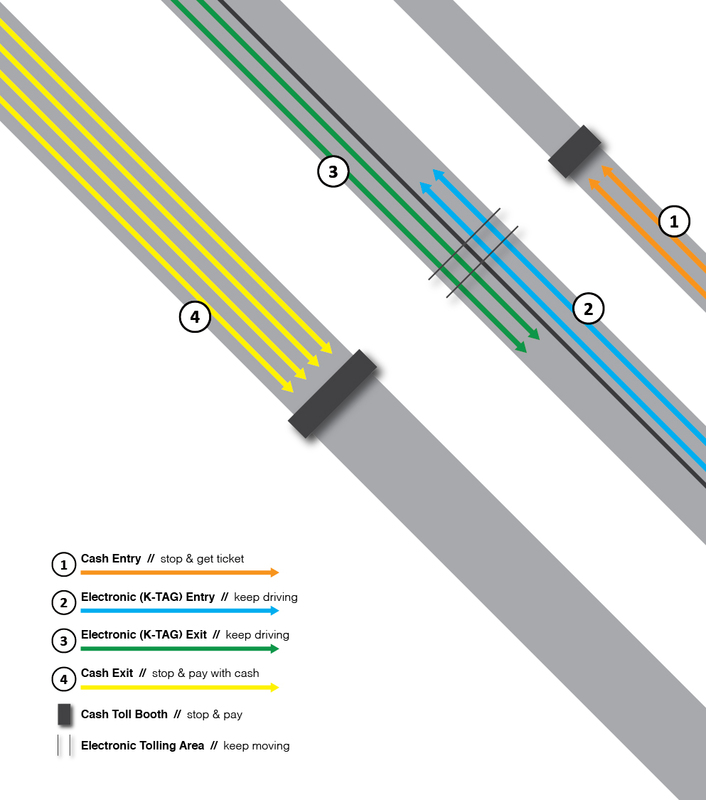 Check out this open road tolling graphic or watch a video simulation video (ORT-electronic, ORT-cash) to see how it works. Pay attention to posted signage. Don’t stop in the electronic lanes. Forgot to exit right? If you didn’t get a ticket upon entry, let your collector know (or press help button on a self-pay machine) when you exit. If you didn’t exit right to pay, your “missed toll” is considered a violation per Kansas statute and the vehicle’s registered owner will be mailed a toll statement at the video enforced rate. Get a K-TAG to keep moving at highway speeds and pay less for every toll. If you have a K-TAG, make sure it is properly mounted & your account is in good standing with valid contact and payment information. K-TAG customers receive email notifications about expiring and expired payment information. Make sure ktag@ksturnpike.com and estatements@ksturnpike.com is placed on your email provider’s whitelist. If a driver exits using an electronic lane without a valid compatible transponder, the “missed toll” is considered a violation, per Kansas statute, and will be tolled at the video enforced rate based upon the vehicle’s class (see chart below). Payment for missed tolls cannot be accepted until the trip is processed in our system and assigned a statement ID. Trips are processed within three business days and statements are typically mailed within two weeks of the trip to the vehicle’s registered owner. At that time, the video enforced fare can be paid here using information from your toll statement. Video enforcement has replaced gates at 10 toll plazas and allows KTA to offer Open Road Tolling. Learn more about video enforcement.